This is the first text to examine the use of statistical methods in forensic science and bayesian statistics in combination. The book is split into two parts: Part One concentrates on the philosophies of statistical inference. Chapter One examines the differences between the frequentist, the likelihood and the Bayesian perspectives, before Chapter Two explores the Bayesian decision-theoretic perspective further, and looks at the benefits it carries. Part Two then introduces the reader to the practical aspects involved: the application, interpretation, summary and presentation of data analyses are all examined from a Bayesian decision-theoretic perspective. A wide range of statistical methods, essential in the analysis of forensic scientific data is explored. These include the comparison of allele proportions in populations, the comparison of means, the choice of sampling size, and the discrimination of items of evidence of unknown origin into predefined populations. Throughout this practical appraisal there are a wide variety of examples taken from the routine work of forensic scientists. These applications are demonstrated in the ever-more popular R language. The reader is taken through these applied examples in a step-by-step approach, discussing the methods at each stage. Franco Taroni, Institute de Police Scientifique et de Criminologie, University of Lausanne, Switzerland. Silvia Bozza, Departimento di Statistica, Universit`a di Venezia, Italy. Alex Biedermann, Bundeskriminalpolizei, Kommissariat Kriminaltechnik, Switzerland. Paolo Garbolino, Faculty of Arts and Design, IUAV University, Venice, Italy. Colin Aitken, School of Mathematics, University of Edinburgh, UK. I The Foundations of Inference and Decision in Forensic Science. 1.1 The Inevitability of Uncertainty. 1.2 Desiderata in Evidential Assessment. 1.3 The Importance of the Propositional Framework and the Nature of Evidential Assessment. 1.4 From Desiderata to Applications. 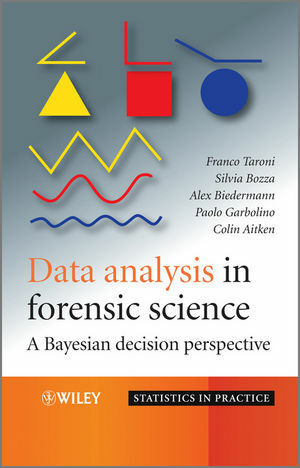 1.5 The Bayesian Core of Forensic Science. 1.6 Structure of the Book. 2 Scientific Reasoning and Decision Making. 2.1 Coherent Reasoning Under Uncertainty. 2.2 Coherent Decision Making Under Uncertainty of Reasoning. 2.3 Scientific Reasoning as Coherent Decision Making. 2.4 Forensic Reasoning as Coherent Decision Making. 3 Concepts of Statistical Science and Decision Theory. 3.1 Random Variables and Distribution Functions. 3.2 Statistical Inference and Decision Theory. 4.2 Bayesian Decision for a Proportion. 4.3 Bayesian Decision for a Poisson Mean. 4.4 Bayesian Decision for Normal Mean. 5.3 Decision-Theoretic Evaluation of Credible Intervals. 7.3 Graphical Models for Sampling Inspection. 7.4 Sampling Inspection under a Decision-Theoretic Approach. 8.2 Standards of Coherent Classification. 8.3 Comparing Models using Discrete Data. 8.4 Comparison of Models using Continuous Data. 8.5 Non-Normal Distributions and Cocaine on Bank Notes. 8.6 A note on Multivariate Continuous Data. 9 Bayesian Forensic Data Analysis: Conclusions and Implications. 9.2 What is the Past and Current Position of Statistics in Forensic Science? 9.3 Why Should Forensic Scientists Conform to a Bayesian Framework for Inference and Decision Making? 9.4 Why Regard Probability as a Personal Degree of Belief? 9.5 Why Should Scientists be Aware of Decision Analysis? 9.6 How to Implement Bayesian Inference and Decision Analysis?